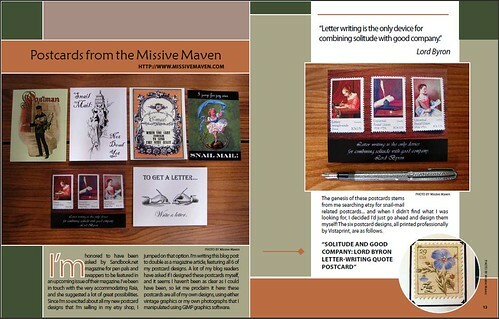 The Missive Maven: Check out the latest Sandbook pen pal magazine - I'm in it! Check out the latest Sandbook pen pal magazine - I'm in it! Remember the blog post I did last month for Sandbook magazine? It showcased all 6 of my new postcard designs. Well, it's hit the internet newsstands! My thanks to Raia for the opportunity to crow about my postcard designs in this great magazine. Go to Sandbook.net to download August issue in PDF format. Congratulations, Missive Maven --sounds like something I would be interested in for sure. That's so cool! I'm proud to have one of those cards in my collection!!! Keep up the amazing work, Missive Maven! We were really happy that we had the chance to work with you! Your creativeness is inspiring.